The 1959 romantic comedy 'Dil Deke Dekho' [review] showcased an impressive amount of young, fresh movie talent. It was director Nasir Hussain's only second feature, it starred Shammi Kapoor in the process of establishing the stylish & romantic hero persona that would make him a legend, it was the debut of Asha Parekh (the first MFT3F sampler's cover star), and it was the first film to be scored by Usha Khanna. It's something of a wonder how a just 17-year-old girl with no formal training managed to gain entry onto the Bollywood music scene, even if she was aided by O.P. Nayyar. She wasn't the first female music director in Bollywood (Ishrat Sultana, Jaddan Bai and Saraswati Devi had all scored films in the mid-1930s), and there have been others since, but she is by far the best known. I've really liked the (few) soundtracks I've come across by her, so I've been wanting to hear this one for quite some time. I'm happy to say it doesn't disappoint. With a flurry of strings and a drum roll she jumps right into it on the title track; very much in the spirit of Nayyar's own work (with more than a nod to The McGuire Sisters' 'Sugartime'), and perfectly compelling. 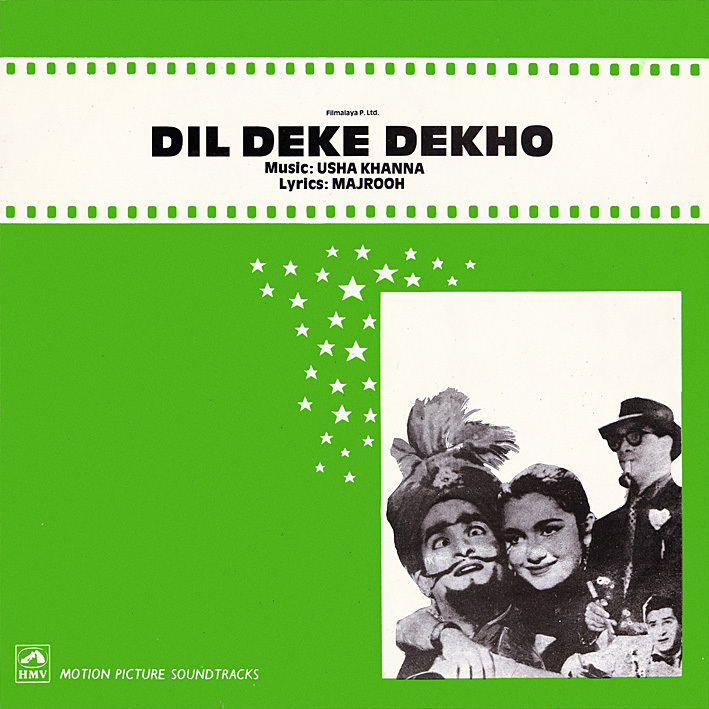 There's a joie de vivre flowing through the album; 'Bade Hai Dil Ke Kale', 'Bolo Bolo Kuchh To Bolo', 'Dilruba Meri Neeta' (nicked from Paul Anka's 'Diana'), 'Hum Aur Tum Aur Yeh Sama'; all lovingly performed by Mohd. Rafi and Asha Bhosle (who came to consider Usha as a daughter). Songs that are damn hard to dislike. This would be impressive from any first time music director; from a teenager, it's a marvel. I never even heard of Usha Khanna before, and now I need to seek out everything I can find from her. I can't tell you how much I appreciate this. Thank you. If you don't mind some recommendations from a stranger, the soundtracks from "Haye Mere Dil", "Shabnam", "Main Wohi Hoon", and "Main Hoon Alladin" are fantastic in my opinion. They are so-called B-movies, but those films often contain the best music (although the soundtracks may be harder to find). I really like Hawas from 1974. A masterpiece of Usha Khanna, She gave several musical hits but her command over Arabian Music was splendid though it was widely speculated that her father was behind her musical success as he gave music in her albums but never disclose this fact just to boost her music directors carrier but after her fathers demise she alone gave several big hits also.